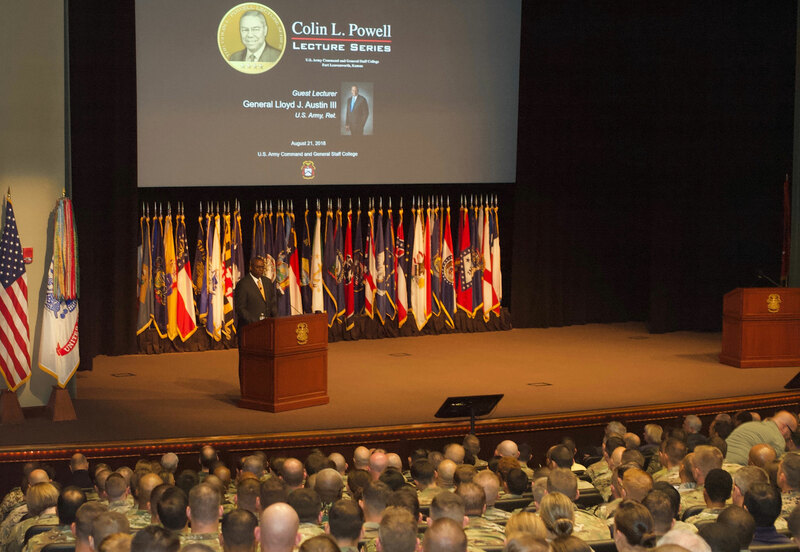 Gen. Lloyd J. Austin III, U.S. Army, Ret., the former commander of U.S. Central Command, presented the annual General Colin L. Powell Lecture for students of the 2019 Command and General Staff Officer’s Course, Aug. 21 at Fort Leavenworth’s Lewis and Clark Center. 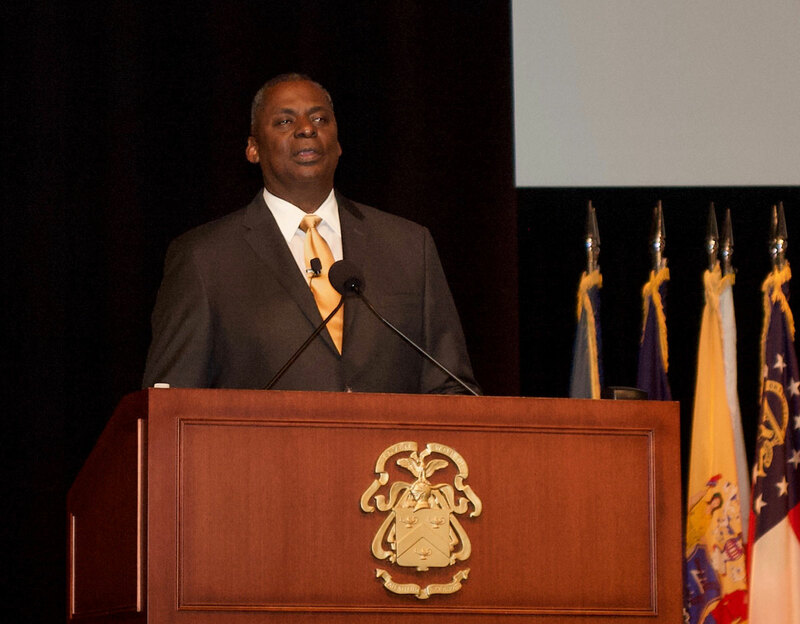 Austin shared three things with the students — the evolution of the military over the past four decades, what he sees as the military’s focus going forward, and lessons learned over his 40-plus years in service. 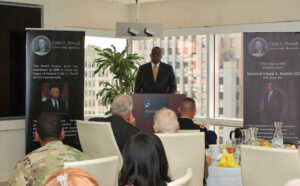 Gen. Lloyd J. Austin III, U.S. Army, Ret., speaks at a luncheon in downtown Kansas City hosted by the CGSC Foundation. 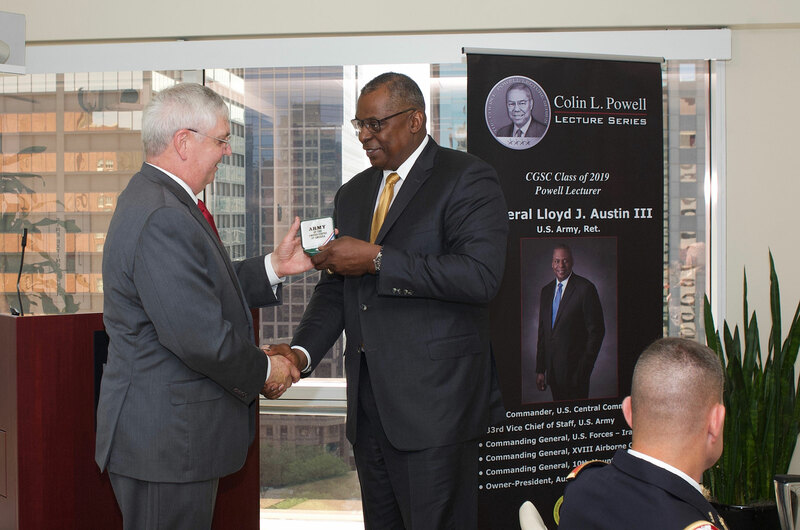 During a luncheon in downtown Kansas City, CGSC Foundation President/CEO Doug Tystad presents Gen. Lloyd J. Austin III, U.S. Army, Ret., with a Colin L. Powell Lecture Series silver commemorative coin for his support of the program. Austin talked about his experiences as a lieutenant in 1975 and how the Army rapidly changed from the conscript Army of Vietnam to all-volunteer, at the same time introducing the “Big-5” modern weapons systems and AirLand Battle Doctrine. AirLand Battle is still the Army’s basic warfighting doctrine, said Austin. He also told the students that who we fight, where we fight, and how we fight will continue to evolve. According to TRADOC, there are no facts about the future said Austin. In order to anticipate challenges you have to make some assumptions. 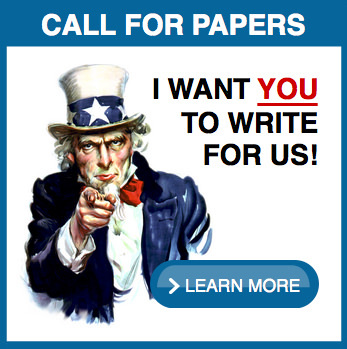 We can assume we will continue to be contested in all domains. We can expect to encounter trans-regional, grey-zone, and hybrid strategies presented by regular and irregular forces, criminal elements and terrorist organizations affecting our strengths and mitigating our advantages. We can expect increased speed of human interaction. We can also expect to see rapid co-evolution between competitors. We can expect increased lethality by virtue of ubiquitous sensors and adversaries can restrict us to temporary windows of advantage with periods of physical and electronic isolation. That wisdom was the first and most important lesson that Austin shared with the CGSC students. “Your job is to lead them, and take care of them, and ensure they have everything they need to be successful,” he said. “My second piece of advice, the one thing that will have the most influence on your life and on the impact that you’ll have is the strength of your character,” he said. That’s why the Army values are the bedrock upon which this institution operates each and every day. Third, related to character, is ethics. “Ours is a seven day-a-week, 24-hour-a-day job. How we conduct ourselves whether on duty or off duty, stateside or deployed, is a direct reflection of our profession,” he said. “My fourth piece of advice is to never forget that ours is a team sport,” said Austin. To be successful you’ll need to be able to work together with others and especially your peers, he said. 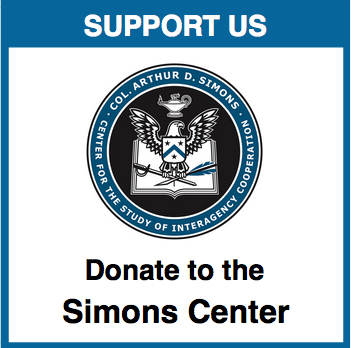 He added that is not just the people in your service but across the joint community, the interagency, and beyond. Make the most of your time at CGSC, Austin said as his last piece of advice. 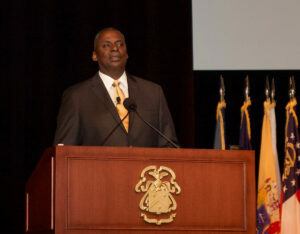 He had earlier quoted President Eisenhower saying how transformative CGSC had been in his military career. It’s a time for professional development and relationship building, but it’s also a time for spending time with your families after running full speed for several years, he said. After his presentation to the class Gen. Austin spent time in a classroom with CGSC students and engaging with them on many of the issues he brought up during his lecture. Before he departed Kansas City, the CGSC Foundation hosted a lunch for Austin at the offices of Spencer Fane in downtown Kansas City. Foundation Chairman Mike Hockley, a partner of the law firm, is the Civilian Aide to the Secretary of the Army for eastern Kansas and a graduate of the U.S. Military Academy at West Point. He hosts periodic gatherings for the West Point Association at Spencer Fane and the luncheon was an opportunity for those members, along with Foundation trustees and other invited guests, to spend some time with Austin. During his remarks at the luncheon, Austin told the attendees that he realizes how much the Foundation and others have done in support of Soldiers and the Army, but asked that they do a little more. Telling the story of how impressive the young men and women in the Army are is vitally important he said. Several attendees at the luncheon who had previously worked with Gen. Austin also had the opportunity to take photos with him. For more photos of the lecture and the luncheon afterward see the album in the CGSC Foundation Flickr site. 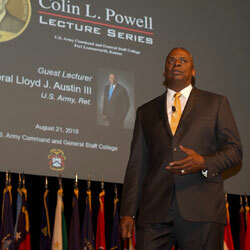 The intent of the Colin L. Powell Lecture Series is to invite national and international distinguished personalities to provide lectures on contemporary issues to the faculty, student body, community and business leaders at the Command and General Staff College. Lecturers in the series range from heads of state, heads of government, senior diplomats, and other distinguished persons who could bring their unique perspectives to help educate the audience about historical or contemporary issues of importance to the nation or the international community.